Cartier has introduced a new flying tourbillon watch, the Cartier Tourbillon and Crocodile Watch. 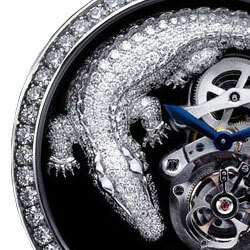 The timepiece is a truly unique design that features a stunning crocodile sculpted from 18 carat white gold and decorated with diamonds, the crocodile also has emerald eyes. The decorated reptile wraps its self around the top half of the dial and guards the movement. The bottom half of the dial is decorated with two water lilies in translucent red and white enamel. The watch features a round 44.5 millimeter case crafted from rhodium-plated 18 carat white gold. The crown is also crafted from circular-grained pattern rhodium-plated 18 carat white gold and is set with a diamond. The Crocodile Watch is powered by the unique in-house flying tourbillon movement caliber 9458 MC which is imprinted with the Geneva Seal. 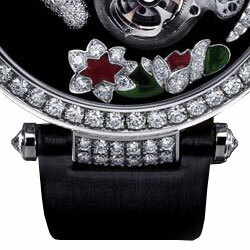 The mechanical manual-winding movement features 167 parts which including 19 jewels. The movement beats at a frequency of 21,600 vibrations/hour, and has a power reserve of up to 50-hours. The C-shaped carriage of the flying tourbillon is also used for indicating the seconds. The intricate movement took the master watchmakers more than 50 hours to complete. The superb case construction allows for a 30 meter water-resistance. The timepiece is completed with a black brushed canvas strap with an ardillon buckle in the white gold and is also decorated with diamonds. 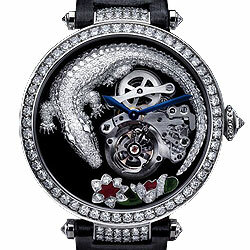 The Cartier Tourbillon and Crocodile Geneva Seal watch, caliber 9458 MC is a limited edition watch of 50 just pieces. Cartier's newest watch, the Rotonde de Cartier Astrotourbillon watch, is ready to make its debut. First introduced by Cartier at SIHH in the beginning of the year, the Astrotourbillon will be available at select Cartier boutiques across the U.S. from June 2010. The new model features the brands newest movement, the 9451 MC movement produced entirely in the manufacture’s workshops. It took five years to develop the highly advanced movement and is equipped with a tourbillon carriage. Available in 18 carat white gold, reference CRW1556204 for $133,000 and in 18 carat rose gold, reference number CRW1556205 for $124,000. Each case is 47 millimeters in diameter and has a circular-grained crown in the corresponding metal set with a sapphire cabochon. The silver guilloche dial with black transfer Roman numeral markers is protected by a sapphire crystal. The case-back has a transparent sapphire crystal. The watch boasts a water-resistance of up to 30 meters. The watch is completed by a black alligator skin strap for the white gold version or a brown alligator skin strap for the rose gold, each fitted with a double adjustable folding clasp in white or rose gold. The caliber 9451 MC Astrotourbillon movement is mechanical with manual winding. It measures 38 millimeters by 9.01 millimeters thick. It has a total of 187 components with 23 jewels. It beats a the frequency of 21,600 vibrations per hour and has an impressive power reserve of approximetley 48 hours. Each movement is individually numbered. 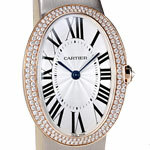 Cartier has unveiled the latest ladies Baignoire watch, one of its most well known watch designs for women. The Baignoire watch line was originally launched in the 1920’s is easily recognizable with its interpretation of the classic tonneau case. the Baignoire go its name was inspired after the shape of the watch’s case which is similar to the rim of a bathtub. This year, Cartier is introducing the Baignoire Grand Modele watch which is a larger version of the original. The watch features a brushed 18 carat gold case and crown set with a sapphire jewel cabochon. The solid silver dial is finished with a sunburst guilloche and blued hands which indicate the Roman numeral hour markers. The watch is available with a beige satin strap with an inner or a gold bracelet with or without diamonds. The strap is completed with an 18 carat gold signed buckle. The watch is powered by an ultra-thin manually wound movement, the Piaget 430C. The New King Sized Chronograph Pasha Seatimer is an interesting addition to Cartier's Seatimer Collection. The dial design is unique to anything else they currently have in their collection. Instead of the standard circle chronograph dial design, the counters are set in a three oval pattern one of which is a slightly smaller oval counter at 6 o'clock. Where the non-chronograph Seatimer in my opinion is a very good looking sporty watch, the new chronograph version seems almost like two separate watches mixed together. The dial seems a bit out of place to me, but perhaps it will grow on me in time as many new designs have before. The new Seatimer has a mechanical movement with automatic winding Cartier calibre 8630, which is the thinnest automatic movement in the world. The dial comes in black or white and displays hours, minutes, seconds and chronograph functions as well as date in a small window between 4 and 5 o'clock. The watch is protected by a scratch-resistant sapphire crystal. It has a unidirectional rotating bezel in steel or 18k rose/yellow gold with engraved Arabic numerals. The larger king-size case is 42.5 mm, which is 2mm larger than the standard Seatimer case. It is water-resistant to 100 meters. The bracelet for the Stainless steel version of the Chronograph Pasha Seatimer is made from steel encased in black rubber, or an all steel bracelet both of which have a steel security clasp. The gold versions have an 18k gold bracelet with black central links and a 18k gold triple safety deployant buckle. 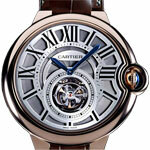 One of the most intriguing watches created by Cartier thus far is the new Ballon Bleu Tourbillon. The Ballon Bleu Tourbillon is Cartier's first that incorporates the brand's new 9452MC tourbillon movement, which bears the Geneva Seal hallmark. The 9452MC movement is mechanical with manual winding, it is comprised of 142 hand-finished parts and 19 jewels and has a power reserve is 50 hours. The Cartier Ballon Bleu gets its name from the sapphire cabochon crown which is incorporated into its rounded case and this version is no exception. It is crafted from 18K pink gold, and it measures 46mm across which makes it larger than even the Grand Modele Ballon Bleu which is only 42mm in diameter. The watch also features sapphire crystal on the face as well as the transparent case-back of the watch. The dial has a three-dimensional guilloche silvered look with sun-ray open-worked grid. The watch has Roman numeral markers and sword-shaped, blued-steel hands. The tourbillon carriage is positioned in an untraditional way so that appears to float freely above the dial adding to the already impressive design.. Copyright © 2001- Finest Watches Inc. All Rights Reserved.